The Sony PVMA250 25" Professional OLED Production Monitor with Version 2.0 Firmware is suitable for both field and studio use. It features a 24.5" diagonal OLED panel with a native resolution of 1920 x 1080. Because of the OLED technology employed, each pixel can be switched completely off--unlike typical LCD displays--for a much closer approximation of true black. It can be connected to standard and high-definition video sources via SDI or HDMI, as well as analog standard-definition sources through composite. The PVMA250 features two SDI inputs with a loop-through out that support 3G-SDI, HD-SDI, and SD-SDI signals at resolutions up to 1080p60. In addition, 24 fps is supported, including 23.98p, 23.98PsF, 24p native, and 24PsF. It features an HDMI input that supports 1080p60, 24p, 23.98p, standard definition, and several computer resolutions. A composite input with loop-through output provides connectivity for standard-definition analog devices, and is paired with a 3.5mm stereo mini jack audio input. A front panel 3.5mm headphone jack allows users to monitor embedded audio locally, and there is also a 1W built-in speaker. Two Ethernet ports provide connectivity for serial and parallel remotes. 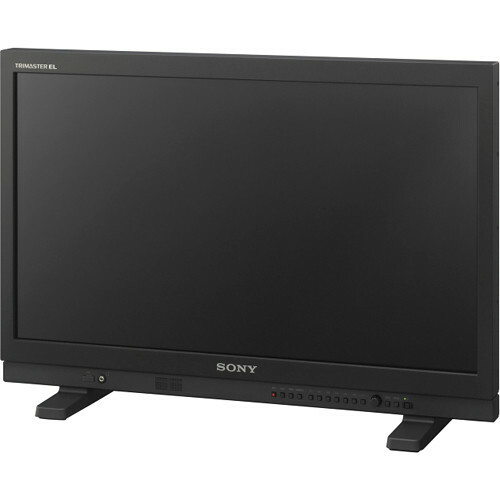 Many third-party options can be used, as well as the separately-sold Sony BKM-15R and BKM-16R. The monitor includes a removable desktop stand, and is compatible with standard VESA 100 x 100mm mounting hardware. Provides better off-axis viewing than many LCD-based alternatives, allowing users to accurately evaluate the image even if positioned off to the side. It features an 89° viewing angle in all directions, while the contrast ratio remains above 10:1. Box Dimensions (LxWxH) 26.0 x 20.5 x 9.5"
PVMA250 25" Professional OLED Production Monitor with v2.0 Firmware is rated 4.7 out of 5 by 6. Rated 4 out of 5 by Noah Clark from Great monitor for grading with a tweak We bought this monitor after much speculation and research. It came down to this monitor vs. the Flanders CM250. The Sony was more cost effective than the Flanders, but had slightly less features, such as the ability to load in custom LUT's. Since I'm not using this monitor on set as a DIT would, that wasn't very important to me.The Sony was also much, much lighter than the Flanders, which again wasn't important to me as I'm not lugging it around, but still a nice feature. It's really light weight!After talking to the Flanders rep on lead time, I couldn't get the Flanders for at least 3 weeks. We have graded over 300 hollywood feature films and this was a big deal as we can't afford any downtime.After much scrutiny the Flanders rep told me that they actually buy their panels from Sony, so the actual OLED panel was the exact same one that they used. The main difference being the feature set that they offered that the Sony didn't. Mostly stuff that wasn't crucial to my work as a colorist.So we went with the Sony. When the Sony arrived, and we turned it on I was shocked to see that it was very yellow / green. Oh no! Is this one wacked out? Did I make the wrong decision? As it turns out, Sony know about this and has a white paper about it. If they know about it, I wonder why they don't calibrate it differently (but whatever). After calibration the Sony looks great and I'm sure this was a great purchase (whew! )The only thing that's kinda weird about it, is there's no way to tilt or rotate the screen. It sits firmly on two feet and is in a fixed position. No biggie, but I feel that's kind of a design flaw.Overall I would recommend this purchase to anyone who is serious about grading and wants a consistent, reliable result. Rated 5 out of 5 by Jason from Great monitor!! This monitor is a great update to the PVM2541A. Much lighter with the same great picture. I'd highly recommend it to anyone. Rated 4 out of 5 by Anonymous from Amazing monitor, but glossy screen It's got the truest blacks of any monitor I've seen, but I'm afraid the semi-glossy screen was a deal breaker. Rated 5 out of 5 by Walter Volpatto CSI from one of the best we use it extensively at work for professional use, it is one of the best. Rated 5 out of 5 by Ben from Rock solid Best color reference monitors we have in our facility. The PVMA's fixed a wide angle issue with the original PVM series (colors got washed out when you looked from more than 15* or so off center) so once that issue was fixed, these are now our go-to. We run 4 of them as artist reference and every 6 months or so when we have our engineer calibrate, these drift the least out of all displays. Rated 5 out of 5 by Robert from Favorite Monitor Ever. If you can afford to buy this monitor, do it immediately. Im a freelance colorist in NYC and facilities everywhere love this monitor. Theres no cheaper OLED 25 option. The Flanders equivalent costs $25,000. Is there a rack mount kit available for the PVM=A250? Yes,there is a rack mount kit available for the PVM A250. B&amp;H sold us the Sony MB-L22 and it worked very well. Does this have a dual link DVI-D input with native 1080 120hz or higher refresh? i wounder if you have this monitor in stock B, or a demo, at low cost?, thank you. The prices that we have listed are the best that we can offer. How can you get this on battery power? I see firmware v2.0 supports AdobeRGB. This could also serve me as a photo editing monitor along with my video needs. Is HDMI still limited not to be able to use 1920x1080 for PC usage or it supports 1080p plus other mentioned resolutions in the specs? Does the monitor have any anti-burn-in measures built-in?